Imaginary pets are cool. I'm not knocking them down. Kids with pet rocks, you keep on trucking. What I'm here to say today is that the latest weird photos coming out China are not a trend. Lonely Chinese youths aren't walking cabbage pets. It's unknown how Western media outlets such as the UK's Metro and the Huffington Post got this information, but over the weekend, they reported that young depressed (and shirtless?) 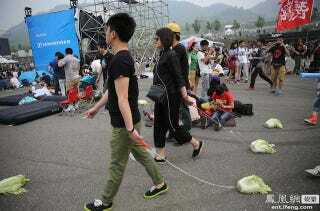 Chinese were spotted walking cabbages on leashes. What really happened is a strange art performance that took place during Beijing's annual labor day music festival, the Midi Music Festival. China celebrates labor day every year on May 1. The holiday is commonly known as the May Day holiday and it spans a total of roughly 3 days (4 if you're lucky). During the holiday, millions travel across the country and various activities are held. It's generally an all around good time. During this year's festival, a series of young people too hip for the rest of society were spotted dragging heads of cabbage on leashes. The whole thing was an art project by Chinese artist Han Bing! Han has been walking cabbages across the world for the last 14 years! A quintessentially Chinese symbol of sustenance and comfort for poor Chinese turned upside down. If a full stock of cabbage for the winter was once a symbol of material well-being in China, nowadays the nouveau riche have cast aside the modest (monotonous) cabbage in favor of ostentatious gluttony in fancy restaurants where waste signifies status... Yet, for the poor and struggling, the realities of cabbage as a subsistence bottom line have not changed—what's changed is the value structure that dictates what—and who—is valuable or worthless in Chinese society. Bringing the teenaged art project to Midi this year, Han and the various people who took part told the various media outlets present that the idea of walking cabbages is to reflect upon society. According to iFeng.com, they believe that people have become lonely slaves and that their lives are tough to the point where they can't decompress with the help of a pet. In lieu of a dog, the cabbage is the object that they can take out their feelings on. It's easy to point out that media outlets are always looking for the next big weird China story and that certain folks who don't read Chinese have simply jumped the gun on this one. I'm not even sure where they got their information... As James Griffiths of That's Online points out, "if it seems too good to be true, and more importantly, isn't reported in the Chinese press, it's probably not true."